A John Hopkins economist found that low income black students black students thrive when they have a black teacher in elementary school. South Carolina is experiencing a major shortage in teachers, especially within the ranks of experienced black teachers, and a recent study suggests it could be playing a role in black student dropout rates. The South Carolina Oversight Committee reported fewer students are completing teacher education programs than ever before. In the 2015-2016 academic year, only 1,898 students completed a teacher education program compared to 2,447 students in 2012-2014. In 2017 only 5 percent of graduating seniors expressed interest in education careers. This teacher shortage is detrimental to all students, but according to research by Johns Hopkins University, it can be especially harmful to the aspirations of black students. African-American students have statistically been more successful if they have had a black teacher during elementary school, the John Hopkins study unveiled in April 2017. The teacher shortage lessens their chances of having a black teacher during that period. According to the National Center for Educational Statistics, 81.3 percent of teachers in South Carolina are white, while 15.5 percent are black. The John Hopkins University study showed that when black children in grades three through five have at least one black teacher, their chances of dropping out decrease by 39 percent, and their chances of having an interest in college increase by 29 percent. Currently 4.3 percent of black students drop out of high school, and only 3.5 percent of white students drop out, therefore the need for black teachers is essential in order to close this gap. With the number of black teachers in South Carolina already low, the current statewide shortage of teachers will reduce the number of black teachers more, which black students cannot afford. “We have 79 percent black students, and about 10 to 15 black teachers [in our school]. I do wish there were more teachers for these students to identify with, but every year we lose more great teachers to higher paying jobs. 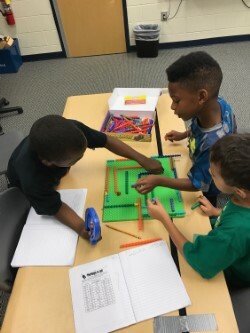 As a result class sizes get bigger and some kids get lost in the shuffle,” said Ali Blackmon, a second-grade grade teacher at Bridge Creek Elementary in Richland District 2. Black students are not the only ones to recognize the lack of black teachers in South Carolina, it is noticed by whites as well. “The first black teacher I ever had was when I was in seventh grade for science. Since then I have probably only had one or two. Even in college it seems rare,” said Austin Bowen of Greenville. The John Hopkins study found when the same black student is evaluated by both a white teacher and a black teacher, the white teacher is 30 percent less likely to believe the student will graduate from college, and 40 percent less likely to believe they will graduate from high school. The John Hopkins study said the power of expectation a teacher has for a student has a major effect on their performance. That analysis seems to resonate with students such as Myers, who still recalls the diligence of his high school teacher.